It’s hard to believe it’s been almost three years since Laura Gibson’s last recording, Beasts of Seasons, was released. But it’s not as if she’s been sitting on her hands the whole time since then. Early in 2010 Laura collaborated with sound collagist Ethan Rose for the ethereal Bridge Carols. And she has toured relentlessly all across the US, with occasional forays into Europe and the UK. In the Fall of 2010, she hooked up with Sean Lennon and his talentless model-girlfriend (Claudine Longet for a new generation—she makes Zooey Deschanel seem like Beverly Sills), Charlotte Kemp Muhl, for one of their Ghost of a Saber Tooth Tiger concerts in New York City. Then in January 2011 Laura toured as support for GOASTT with stops in Texas and up the West Coast. 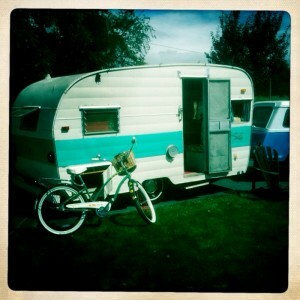 And in her spare time she has been busy retrofitting a vintage ’62 Shasta trailer into a mobile recording studio. Mature and introspective, Gibson’s songs trace the rocky terrain of a barren landscape of hardscrabble insights strewn across escarpments of desolation, through thickets of despondency and despair. It’s not that depressing. There are some berries among the briars. But, she displays the sensibilities of a poet—the antique environmental emotionality of Emily Dickinson, the idiosyncratic tangle of a Plathian knit of knotted nets. Ultimately, however, Laura owes the inspiration of her poetic perceptions to no one. While Beasts was produced by Tucker Martine (Decemberists, My Morning Jacket) for Portland’s Hush label, the new album is being released on Seattle’s Barsuk Records (early Death Cab, Mates of State, Menomena, John Vander Slice, and Nada Surf). It was produced by Calexico’s Joey Burns and bears many of that band’s subtle, more wistful, windblown properties. Every instrument placed with a purpose—even if that purpose is not always abundantly clear. Burns makes a noble effort toward delicately emblazoning the rustic fabric of Laura’s scratchy voice with washes of color and layers of subtle texture without overwhelming the fragile qualities of her work. Her vocals at all times remain prominent in the mix, which in and of itself is quite a technical achievement given that most people talk louder than Laura sings. Production-wise, this album launches where the song “Spirited” left off on Beasts. To that point, the title track rumbles in on a tight, snapping snare and a walloping, galloping rubbery tomtom sound that resembles Rolf Harris’ wobbleboard on “Tie Me Kangaroo Down.” Various random crashes, banshee-like guitar wails and creaking male backing vocals beamed in from another dimension flair and flicker in the mix. This is as close to a radio-friendly single that Laura has thus far concocted in her still nascent career. “Milk-Heavy, Pollen-Eyed” is closer to what one has come to expect of a Laura Gibson recording. Her downy voice folds like eggwhite peaks upon sparse instrumentation: acoustic bass, vibes, clarinet and plaintive nylon string guitar. A pretty ballad with a lovely, lilting vocal melody. Take “Skin, Warming Skin” for instance. A sort of Joanna Newsome fairy magic pall floats over the simple acoustic guitar and Enya-like vocal theme, as mournful steel guitar moans in the distance. Very pleasing. The Victrolla, scratchy record quality of the Oh, Brother Where Art Thou flavored hymn, “The Rushing Dark,” may be using an effect that has already been used too much, but it’s a nice song and an absorbing arrangement. The angelic groan Laura lends the magical “Red Moon” harkens to a time in the musical past that never actually existed, recreated only in pastiches such as this. It may be that this song is a distant cousin to Maria Muldaur’s “Midnight at the Oasis.” What is the word that defines the nostalgia for a time that never was? Here is the soundtrack for that feeling. More akin in execution to material on Beasts, “Crow/Swallow” employs a simple reed section and French horn to create a Ralph Vaughan Williams-like sensibility behind Laura’s brittle vocals. Pastoral. Where a reference to Icarus seems to hover above that first verse and chorus, the imagery shifts through the second chorus “If you’re drawn to the flame/I cannot question your ways/If you’re drawn to the flame/Be not afraid of the fire.” Be not afraid of the fire sounds like something Sarah McLachlan might have said twenty years ago and should probably be permanently retired. It’s okay to say “Don’t be afraid of the fire.” People will still think you’re a poet. And the inexplicable, horrible, bashing snare smashes through the choruses in the back half of the song are truly ill-advised. Jawdroppingly distracting. Eek! “Time is Not” is buffeted by little waves of far off sounds—availed of some sort of orchestral sensibility, sailing through the beautiful chorus propelled by breezy acoustic guitar, vibes, piano, and bubbling drums. Laura murmurs a gorgeously delicate melody. It might have been nice if the beguiling rhythm of that charming chorus would have leapt to the fore sooner. As it is, it does not take over until midway. A shorter version, an edit with mostly the uptempo half, would kill on radio or in a film. Here it simply takes too long for the song to fully spring to life. But it’s really great, all the same. Finally, “Feather Lungs,” is accompanied by judicious piano, bass (no guitar), and segments of more “Oh, Brother…” siren calls. The poignant string section seems lifted almost directly from the National’s “About Today,” but is quite effective in this setting. So, I don’t know about you, but I’m noticing this nautralistic sensual anima thing fluttering around in the song titles, lyrics and moods: “Milk-Heavy Pollen Eyed,” “Skin, Warming Skin,” “Lion/Lamb,” “Crow/Swallow,” “Feather Lungs.” Then there’s “The Fire,” “Red Moon,” “The Rushing Dark,” which amply cover atmospheric conditions. Georgia O’Keefe set to music. It makes for a distinctive thematic structure as to the goings on here, but one doesn’t wish to pry in subject matter so deeply personal and private. This is a strange album, more strange than Beasts of Seasons, which was thematically a pretty strange album in its own right. It’s an uneven record. 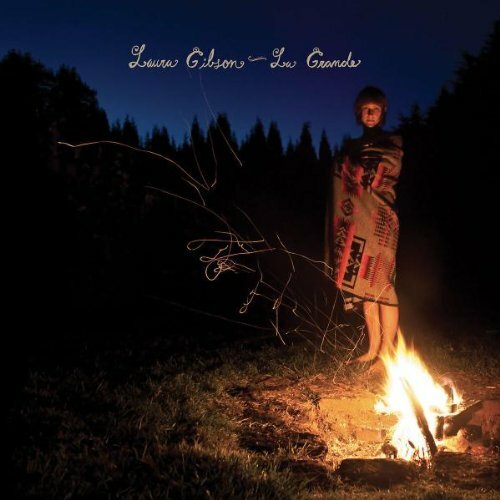 Producer Joey Burns, in an attempt to broaden her sonic palette, sometimes lards Laura Gibson’s tender, sensitive songs with unnecessary flotsam. One cannot change her music merely by adding gratuitous ornamentation. In many instances, “LaGrande,” “The Rushing Dark,” “Red Moon,” “Skin, Warming Skin,” for example, that ornamentation works. But there are many places where the production seems plain wrong—wrong for the songs and wrong for the singer. At some point, Laura Gibson will want to decide whether she wants to be the modern version of a torch singer, like a high-prairie Edith Piaf, or whether she would prefer to create confections more oriented to the pop market. She is obviously a very talented singer and songwriter. But thus far in her short career, no producer has given any indication that he really understands what to do with her quirky abilities.